Courtney Hill lost her husband Brian in a tragic truck accident in February 2016. Brian was a retired Navy Veteran and had even served in Afghanistan, Iraq, and Kuwait. The couple met during a snowstorm in Illinois in 2011 and had been in love ever since. The couple had one beautiful daughter named Reagan. Before Brian’s death, they decided that they wanted to build their family and have more children. They even took a pregnancy test the morning Brian was killed. It tested negative. Only days later, Courtney took another pregnancy test. The results came back positive, but just 25 weeks later her doctor gave her heartbreaking news. Here’s her story. When Courtney found out she was pregnant, she was shocked. At the funeral, she took a moment at the wake to tell him that she was pregnant. A month later, Courtney began to experience unusual pain. She had no idea what was happening and feared that it was possible she had had a miscarriage. She prepared for the worst. 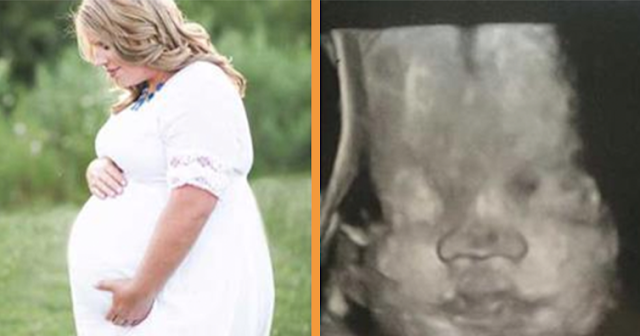 She went to the hospital and was shocked to find out that she wasn’t having just one baby. She was, in fact, having triplets! “My jaw DROPPED. I’m excited to have three more smiles that remind me of him,” Courtney said about her reaction to the shocking news. Courtney was struck by tragedy again when doctors revealed to her at an appointment just 25 weeks into her pregnancy that one of her triplets had passed away. Courtney had already picked out names for the triplets. She named the son she lost Brady. Courtney was shocked, confused, and above all devastated. “It caught me off guard,” Courtney said. She had no idea that there had been anything wrong and was heartbroken to find out that she had lost one of her babies. Courtney’s surviving babies Harper and Miles were born on September 21. Courtney has a hard time explaining to strangers that they are not twins. Although Courtney and her family had a heartbreaking year, Courtney tries to remain positive and honor the memory of her late husband.